I am fascinated by the colourful graffiti in Brighton. There are some very good artists out there brightening up the walls. In it’s place I think it’s really cool and may well make a study of it. 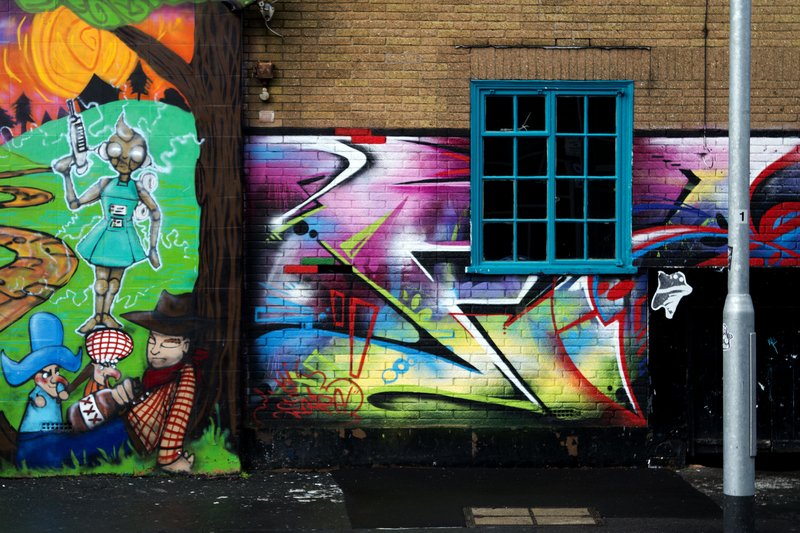 Here is a photo I took of some graffiti just outside the Grand Parade Campus. Today we had our first tutorial with Sam Proud. He showed us some of the cool artwork he was involved in with vinyl sleeves and the like which I thought were excellent. Of course I was brought up in the days of vinyl records before CD’s so I could really relate to that. I liked the flash animations also. Today we made a WordPress Blog and we will be using WordPress for web based authoring of web sites, etc. in the future and I am looking forward to this. I have made websites using a tool called Serif WebPlus X5 and it’s really good but I am pleased to be able to find out more and go in a bit deeper. WordPress looks good and it’s always when you get a chance to use something and gain some familiarity that you start to be able to feel confident with it. I really enjoyed today and so far am loving being at University, it’s briliant!! I started my MA last week and this is the week of our first tutorials. I am sitting here in the Multimedia Authoring and Web Design module and writing a blog in WordPress which is something we are going to be learning a lot about.